Last week, I attended a yoga class. At first, I was excited to be in a class where I was simply attending, and not teaching. It had been a long day and I was ready to unwind and have fun. The class started with some basic sun salutations and I quickly warmed up and relaxed into my practice. But then, the instructor opened it up to the class and asked what we wanted to work on. 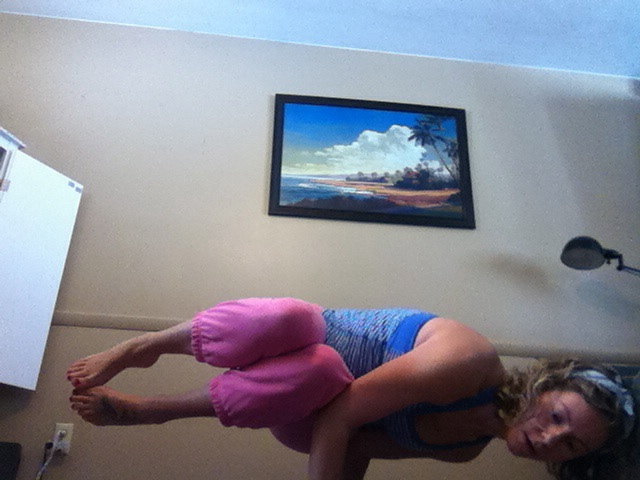 Someone mentioned forearm balances, and I instantly felt my zen run for the door. 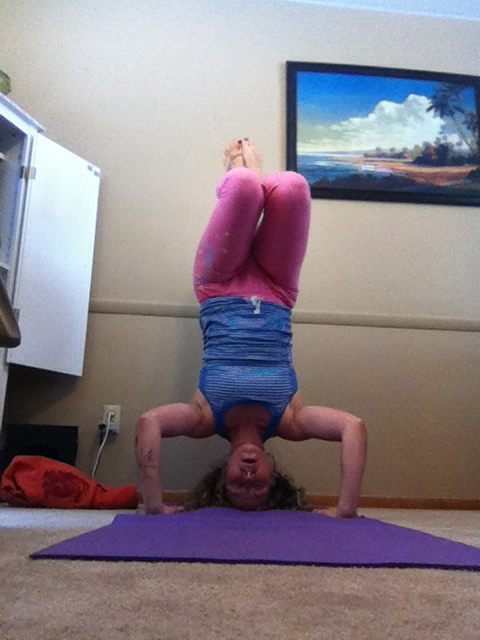 I’ve never been able to do do most arm or forearm balances. I can’t seem to stay up in a handstand, I topple over in side crow, and trying to transition to running man? Forget about it. I can will my legs to move out of side crow all I want, it just doesn’t happen. My sister in law was on her mat beside me, popping up on her forearms, working into scorpion and generally working it like a boss. I was excited to see her progress, but each time I failed to move myself into the desired position, I had to work harder and harder not to cry. Yoga attracts a lot of type A personalities, and I’m no exception. I’m not ok with my limitations. I’m not ok with boundaries. I like to set goals and obliterate them. I left yoga that night feeling defeated and depressed. I’ve done yoga for so long, and yet I feel like there are still so many things for me to learn. On top of that, I still don’t feel as strong as I was before I had kids, especially in my abdominal muscles. But who am I kidding. I couldn’t do side crow before Theo was born either. When I was reading Amy Poehler’s book, Yes Please, she had a chapter on one of her biggest best peeves. She hates it when people call her success “luck,” or worse, try to use her fame as a way to by-pass hard work themselves and, instead, instantly catapult themselves into the limelight simply through their connections. I heard a different speaker just this past week discussing the same topic. He said that we often beat ourselves up when we compare our struggles with someone else’s strengths, but we fail to remember that people don’t wake up strong – they work for it. I want to be like Amy Poehler and like the “strong” people the speaker referenced. I don’t want to compare myself to others and get bummed, I want to put my nose to the grindstone and start making headway through hard work. Remember what I said about not liking limitations? I have a terrible tendency to set really high goals, attempt them, and then when I discover I can’t achieve the goals with perfection, I quit. I like to be good at things, so I tend to only do the things I’m good at. This isn’t always a problem (sometimes it is good to work within your strengths), but it does make attempting new endeavors tricky. I don’t want to stay within my comfort zone my whole life just because I fear/hate failure. I want to be willing to try new things and stick with them until my new things become new practices and my new practices eventually become skills. But, that means hanging out with some serious limitations in the meantime, and like I said, I’m not good at that. This morning, I woke up with resolve. I decided that I can’t complain about my yoga short coming because that is just a recipe for depression. I can decide, however, to give it my best shot. I’m realize this means really settling down with my weakness for the long haul. It means I have to face them, ask them into my home each day, have them unpack their bags, and stay awhile. I know I’m going to get discouraged. Heck. I am discouraged. I want to progress so desperately. Who knows, maybe that is part of the problem? But, I’m not going to give up. Being a SAHM doesn’t make things any easier. I didn’t get more than three minute intervals at a time to work on my poses this morning before my boys interrupted. Talk about frustrating and slow progress. And, as much as I’d like to be in yoga classes where I can continue to grow via someone ele’s instruction, the budget says no. So here are a few photos of my yoga poses now, weakness and all. Hopefully, over the next few months I’ll be able to post photos of some serious progress. Eight Angle Pose. I love this pose, but it need serious work. My chest needs to come forward and my hips need to come up. 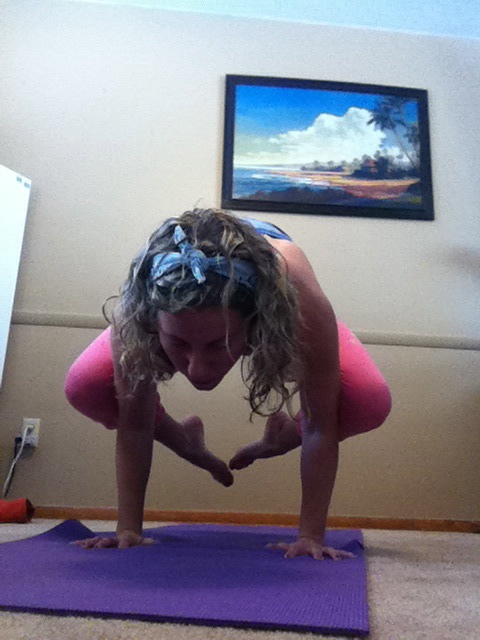 Crow Pose. Crow has become a new friend, and I’ve learned to hold it longer and longer. But it can still be touch and go. Side Crow. Oh side crow. I still fall on my face and get rug burn. I want to get to the point where I can balance in this pose easily. Then, the goal is to learn how to transition into running man. Honestly though, I have no idea how to get my top leg up and my bottom leg out. While in this pose I’ve thought about the transition countless times, but actually getting my legs to move is a whole other story. 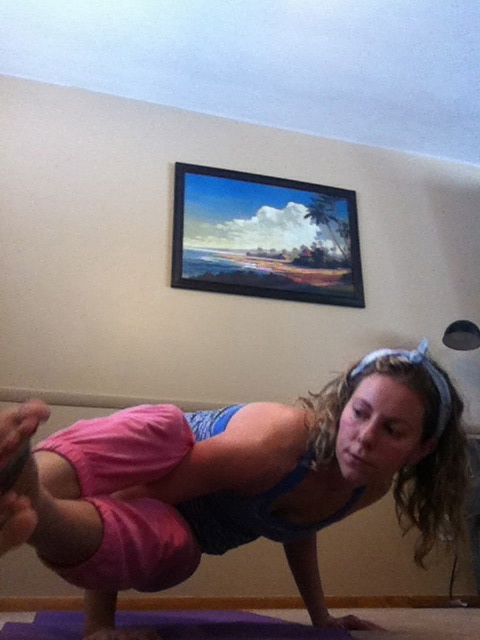 Forearm balances. I’m just scared. Hand stands. I’m not sure why I can’t seem to get my act together with hand stands. I’ve made small progress, but my abs just haven’t got the memo yet about what I need them to do. This is about as straight as I can get my legs before I start to topple back. Grrrrrrr. Grrrrrr. Splits. I’ve got it on one side, not the other. Next Post What is the Meaning of (My) Life?